Although not a type of actuator itself, a form of actuation worthy of mention is where the process fluid pressure itself actuates a valve mechanism. The self-operating valve principle may be used in throttling applications or on/off applications, in gas or liquid services alike. The process fluid may be directly tubed to the actuating element (diaphragm or piston), or passed through a small mechanism called a pilot to modulate that pressure before reaching the valve actuator. This latter design allows the main valve’s motion to be controlled by an adjustable device (the pilot). 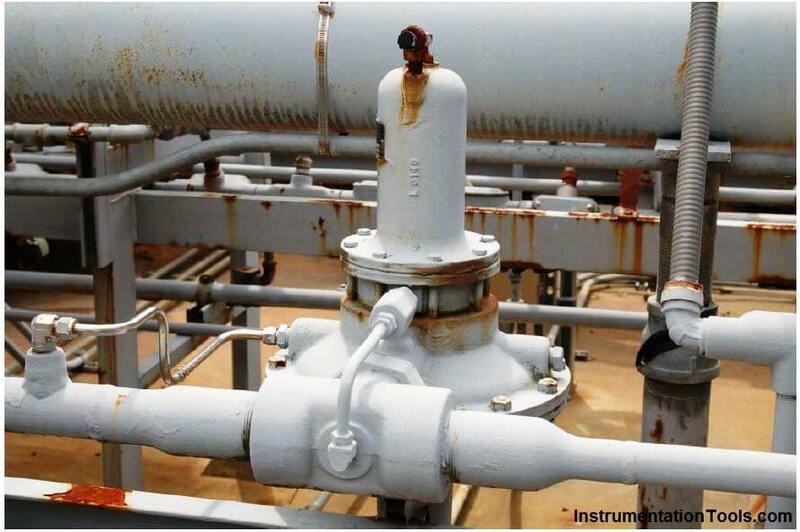 A very common application for pilot-operated control valves is gas pressure regulation, especially for fuel gas such as propane or natural gas used to fuel large industrial burners. 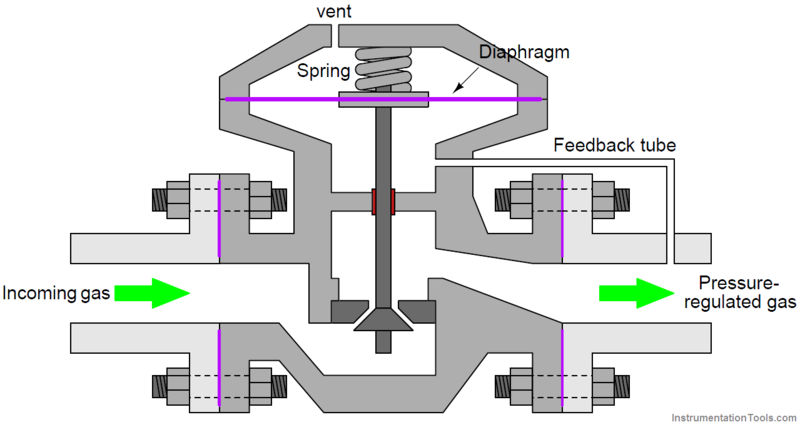 A spring tries to force the plug off the seat, while “feedback” gas pressure from the downstream side of the valve acts against a flexible diaphragm to move the plug toward the seat. The less downstream pressure, the more the trim opens up; the more downstream pressure, the more the trim shuts off. This spring establishes the pressure-regulating “setpoint” value for the regulator. If a different setpoint is desired, the spring must be replaced with one having a different stiffness. A variation on this theme is the pilot-loaded or externally-loaded pressure regulator, using a source of external gas pressure to establish the pressure regulation setpoint. Instead of a stiff internal spring establishing the regulator’s pressure setpoint, the externally supplied loading pressure does that. Since this loading pressure is easily adjusted by turning the knob on the manual-set pressure regulator, the main regulator now becomes adjustable as well. The pilot mechanism controls the main gas throttling mechanism, hence the name pilot. A consumer-grade application for pilot-operated valves is irrigation system control, where the solenoid valves used to switch water flow on and off to sprinkler heads use pilot mechanisms rather than operate the valve mechanism directly with magnetic force. A small solenoid valve opens and closes to send water pressure to an actuating diaphragm, which then operates the larger valve mechanism to start and stop the flow of water to the sprinkler. The use of a pilot allows a relatively small amount of electrical power to control the valve, compared to the amount of electrical power that would be necessary if the solenoid coil were built large enough to actuate the main water valve directly. A special case of self-operated valve is the Pressure Relief Valve (PRV) or Pressure Safety Valve (PSV). These valves are normally shut, opening only when sufficient fluid pressure develops across them to relieve that process fluid pressure and thereby protect the pipes and vessels upstream. Like the other self-operated valves, these safety valves may directly actuate using process fluid pressure or they may be triggered by a pilot mechanism sending process fluid pressure to the actuator only above certain pressures. 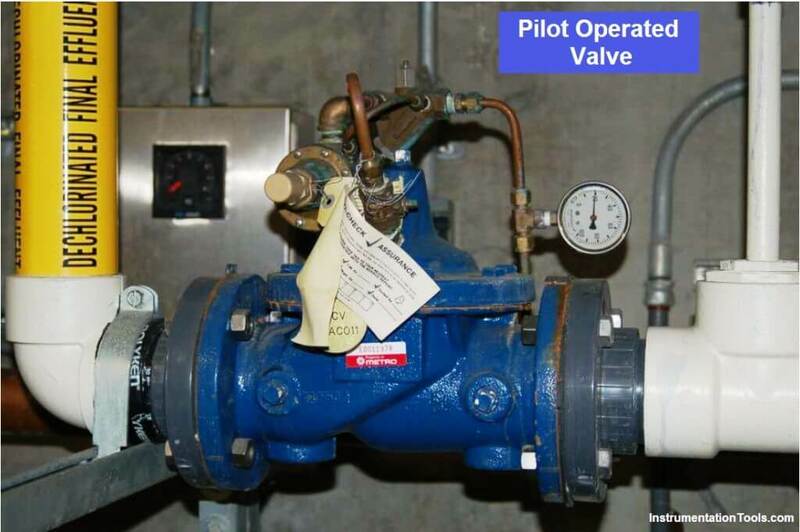 Relief valves using pilots have the advantage of being widely adjustable, whereas non-pilot safety valves usually have limited adjustment ranges. What is Control Valve Flashing ? What is Valve Packing ? How Pilot operated Solenoid Valve Works ? 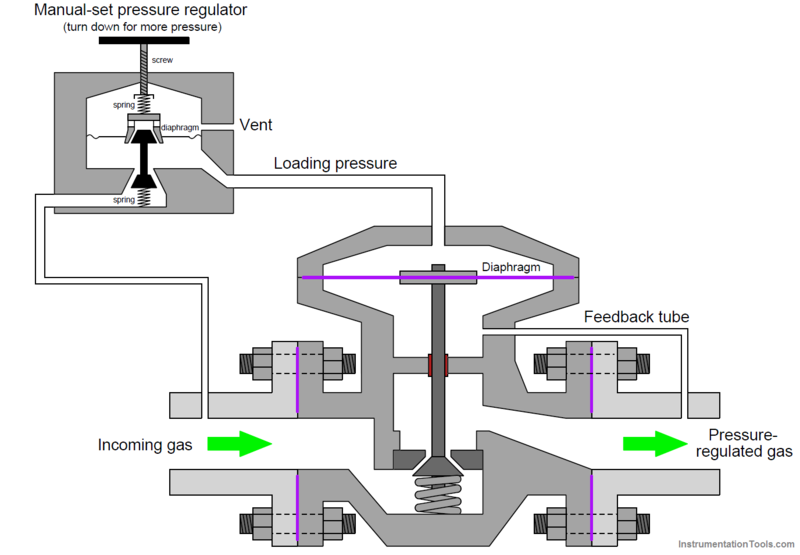 How Diaphragm Valves Work ? How Ball Valves Work ?